Aside from the remarkable fluidity and gesture-like elegance of his work, it is René Gruau’s painterly yet purity of line that draws the eye into his images. Perhaps this has something to do with the fact that Gruau drew from live models versus photographs, the latter practice being the more common among everyday fashion illustrators. The models he chose possessed a “sense of movement,” which embodied his drawing style, and made them come to life. And when one begins describing the legendary artist’s work, perhaps one ought to begin with “life”—in the sense that it’s generally what complicates forms. Take for instance the revolutionary idea of moving into a city, into an apartment. Take for instance the revolutionary idea of sophisticated furniture and artworks and home-cooked meals. Take the revolutionary idea of feeling the liberating buzz of the Phantom when you sit to pee on your fur-lined toilet seat. And take for instance the word fashionable and the requisite descriptor, “elegant.” Take these ideas without trouble, through the several rooms of your soul. Does your life best illustrate the artist—or does he best illustrate yours? I’m guessing it’s the latter. For Gruau was the one who infamously illustrated the fashions of the house of Dior during the 1940s. It is this decade of Dior we love most. 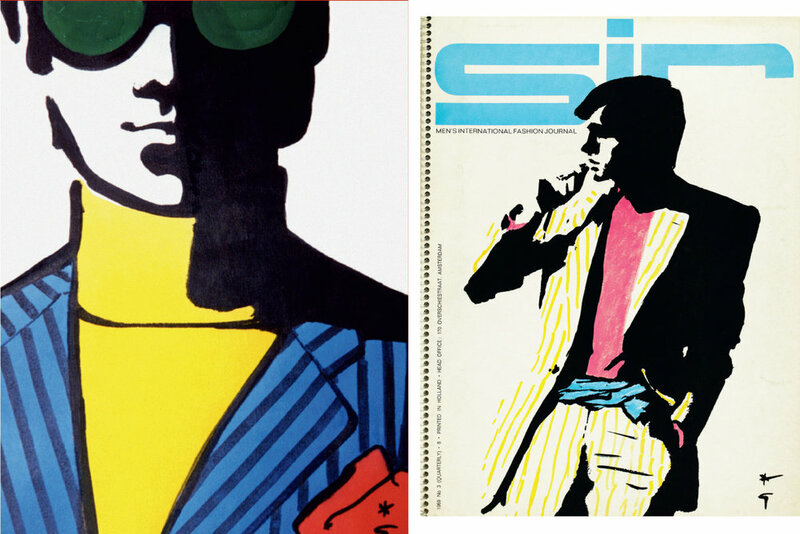 For it is from there, Gruau’s thick and chunky, yet fluid lines defined the male model in the Dutch magazine, Sir: Men’s International Fashion Journal—which, in turn, led to a collaboration between he and Christian Dior for creating Dior Pour Hommes. Beautiful curtains were hung; fabulous parties were attended. Behind closed doors, talks of business, talks of love. Silver flasks and coffee. Peacock feathers. A melancholy way of looking over one’s shoulder on a rainy evening. It is a fitting lifestyle for the Dandy son of Italian and French aristocratic parents. So obviously, Gruau pursued the arts instead of following in the footsteps of his Royal Military Commander father. It is so difficult to march around in ugly boots, chanting the slogan for a country as pretty as a paper bag. But even on the weekends, in nice light, a paper bag can be beautiful. Gruau’s first published work appeared at the young age of 14, and by 18, he was published in the U.S. and Europe, eventually working for many magazines including Marie Claire, Elle, Vogue, Harper’s Bazaar, and Flair. He also rendered the fashions for some of the most notable names in haute couture such as Balmain, Balenciaga, Givenchy, and Rochas. The recent publication of Gruau Portraits of Men by Assouline chronicles René Gruau’s artistic life, and they’ve done a bang up job. The plates of his masculine illustrations are presented in the form of his sketchbook, and his bold, graphically painted male figures remain as strong, dynamic, and refined as the day they were created. Neither time nor distance can cool this love.